This notable home is famous for being the first home built in the modern style. It is also know as the Kings Road House. The architect, Rudolph Schindler came to Los Angeles to supervise the construction of Hollyhock House for Frank Lloyd Wright. While in Los Angeles he built Schindler House. The 2,500 sq ft home was designed as a live/work space for two couples and had additional guest quarters. It sets on a 20,000 sq ft lot. 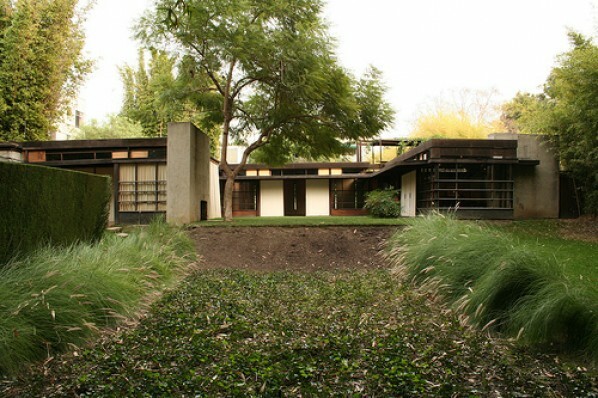 The home was designed by Schindler and built by Clyde Chase using the concrete tilt-up method. It was built from 1921 to 1922 for $12,550. The house is remarkable for its use of industrial materials and concrete. Its open floorplan has no clearly defined living, dining or bedrooms. The house is now open to the public and serves as an exhibition and architectural center. It is open for unguided visits from Wednesday to Sunday, 11:00 am – 6:00 pm, and for tours on weekends. Group tours are available during the week by appointment only. This entry was posted on Thursday, November 18th, 2010 at 3:45 am	and is filed under architecture & design. You can follow any responses to this entry through the RSS 2.0 feed.